Aquascape of the Week: Filipe Alves Oliveira's "Origens"
I love Filipe Alves Oliveira's aquascapes and this one is no different. The different textures in this "mound" style aquascape work well (I particularly like the Crypt in the front left foreground) and the subtle use of red creates a nice focal point. Check out more of Filipe Alves Oliveira's aquascapes on his blog (all in Portugese) or specifics about "Origens" in his post on Aquascaping World. The lights he uses for this setup is amazing! the aquascaping skill that went in to this is pretty amazing, the melding of the different of the color plants. my mind would have never gone down this path but perhaps thats why i like it. keep up the good work on the blog this is seriously the best planted blog on the web. GREAT blog, been fallowing ever since I stumbled onto it! Keep up the excellent work! I got a question for you. 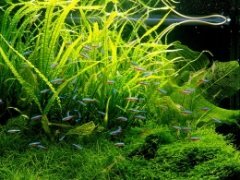 We see lots of info about how to choose and prepare a substrate for a planted tank, but not much on how to maintain it. How do we avoid anaerobic spots? Some say use snails, but, they only stir the top layer. Others say, just poke your substate, that seems ok until you consider your extensive root systems. So, what is the best way to maintain your planted tank substate?